Sainted Sophronii, Bishop of Irkutsk and WonderWorker of all Siberia, known under the family-name Kristalevsky, was born in Malorussia in the Chernigov region in 1704. His father, Nazarii Fedorovich, was "a common man in his affairs, and Sophronii they named Stefan", in honour of the first-martyr archdeacon Stephen. He had two brothers and a sister Pelagia. The name of one brother was Paul. The name of the other older brother is unknown, but there is an account, that he was afterwards head of the Krasnogorsk Zolotonoshsk monastery. The childhood years of Stefan were spent in the settlement of Berezan' in the Pereyaslavl' district of the Poltava governance, where the family settled after the father's discharge from service. When he came of age, Stefan entered the Kiev Theological Academy, where at the time studied two other future sainted-hierarchs – Joasaph, future bishop of Belgorod (Comm. 4 September and 10 December), and Paul, future metropolitan of Tobol'sk. Having received a religious education, Stefan entered the Krasnogorsk Transfiguration monastery (afterwards changed to Pokrov / Protection monastery, and in 1789 transformed into a women's monastery), where his elder brother already pursued ascetic life. On 23 April 1730 he took monastic vows with the name of Sophronii, – honour of Saint Sophronios, Patriarch of Jerusalem (Comm. 11 March). On the night after his taking of monastic vows, the monk Sophronii heard a Voice in the Pokrov church: "When thou shalt become bishop, raise up a church in the name of All Saints", – predicting of his future service. After two years, in 1732, they summoned him to Kiev, in the Sophia cathedral of which they ordained him to the dignity of monkdeacon, and then to priestmonk. Concerning the following period of the life of Saint Sophronii, it says the following in his service-form: "After having taken vows he was treasurer at that Zolotonoshsk monastery for two years, and then he was taken by decree of His Grace Arsenii Berlov of the Pereyaslavl' diocese into the house of his archbishop, in which he was steward for 8 years subject to the Alexander Nevsky monastery, from which during the course of those years he was sent to Saint-Peterburg on hierarchical business, for which in advocacy he spent two years". These facts testify readily enough to the connections of the saint with his original Pokrovsk monastery. During his obedience under the presiding hierarch at Pereyaslavl', he often visited at his monastery, spending the day in quiet contemplation and work, giving example in the making of a monastic brother. During the time of priestmonk Sophronii's sojourn on hierarchical business to the Synod, they showed particular attention to him. And when it became necessary to increase the brethren at the Alexander Nevsky monastery in Saint Peterburg, – 29 monks then in number having been summoned from various monasteries in Russia, in January 1742 was summoned also the future saint. A year later they appointed him treasurer of the monastery, and in 1746 he was appointed to the office of head of the monastery, which he fulfilled for seven years more. For helping him he summoned his fellow countryman, a native of the city of Priluk, – the priestmonk Synesii, and made him the organiser of the Novo-Sergiev monastery, which was associated with the Alexander Nevsky monastery. From this period of time the friendship of the two ascetics, – priestmonk Sophronii and priestmonk Synesii – was strengthened into a single pastoral effort, and they were inseparable until their end in the Siberian land. During these years Saint Sophronii laboured much at the managing of the monastery and improvement of teaching at the seminary located near it. Together with Archbishop Theodosii he concerned himself with the needs of adding to the monastic library. A two-level church was built by him: the top – in the name of Saint Theodore Yaroslavich, older brother of Saint Alexander Nevsky; and the lower – in the name of Saint John Chrysostom. In 1747 the bishop of Irkutsk, Innokentii II (Nerunovich) died. For six years afterwards the territory of the Irkutsk diocese remained without a spiritual head. Finally, the empress Elizaveta Petrovichna (1741-1761) by decree on 23 February 1753 recommended to the Holy Synod the pious head of the Alexander Nevsky monastery Sophronii, as "a person, not only worthy of bishop's dignity, but also quite entirely able to fulfill the wishes and the hopes of the state and the Synod – to take up the burden of episcopal service on the far frontier and satisfy the needs of his flock in that harsh land, amidst wild primitives and lawless people". On 18 April 1753, Thomas Sunday, priestmonk Sophronii was ordained bishop of Irkutsk and Nerchinsk in the Great Uspensky cathedral. Foreseeing difficult service on the distant Siberian frontier, the newly-established bishop did not immediately set off to the Irkutsk eparchy, but rather began to gather up educated and spiritually experienced co-workers. During this period Saint Sophronii visited at his original Krasnogorsk monastery. Also at the holy places of Kiev, he sought the blessings of the Kievo-Perchersk Saints for his service. The constant companion of the saint, just as before, was the priestmonk Synesii, ardently sharing in the life's work of his friend. At Moscow, the Archbishop of Moscow and Sevsk Platon, – who participated in the ordination of then priestmonk Sophronii, provided him further assistance. He taught him fatherly precepts for his impending task, since he was quite familiar with the peculiarities of the Siberian religious manner of life, he forewarned him about the self-willed local authorities, and advised him to gather together trustworthy helpers. On 20 March 1754 the saint arrived at Irkutsk. He went at first to the Ascension monastery – the place of residence of his predecessor, and prayed at the grave of bishop Innokentii (Kul'chitz), imploring his blessing on his impending task. Having familiarised himself with the state of affairs in the diocese, the saint set about the re-organisation of the Spiritual consistory, monasteries and parishes, and turned to the Holy Synod with an appeal to dispatch worthy people for priestly service to the Irkutsk eparchy. Before the arrival of Sainted Sophronii, the Irkutsk monasteries had already a century-old history. The founders of these monasteries were motivated by a fervent desire for ascetic monastic life. The sagacious sainted-bishop appointed as heads of the monastic communities people of piety, wisdom, virtue, and with great experience both of life and things spiritual. In 1754 His Grace Sophronii raised up his friend and companion priestmonk Synesii to be archimandrite of Ascension monastery. This memorable monastic head served the monastery for thirty-three years until his blessed end. In September 1754 the sainted-bishop issued an ukaz (decree), in which concern was noted for the education and upbringing of the children of clergy. By his ukaz to the clergy he considered as a duty the education of their children in the Chasoslov, the Psalter, singing and letters, and this instruction "ought to happen with all industriousness and extremest diligence, so that the children might be able to accomplish the responsibilities of sacristan and deacon according to their due ability". Studying closely both people and circumstances, the sainted-bishop in his sermons and conversations incessantly exhorted all to an higher moral ideal. He devoted particular attention to the reverent and correct doing of Divine-services and priestly Sacraments, and he also watched after the moral purity of laymen; he was concerned about the position of women in the family, and defended them against their unjust inequality. The sainted-bishop attempted everywhere to set straight the ustav (rule) of Divine-services, for which purpose he summoned to himself priests, deacons, sub-deacons and sacristans, who during the time of hierarchical Divine-services participated in the choir or sub-deacons. Journeying about the diocese, the saint noted that not everywhere was the proper attention given to the ringing of bells and incensing, and therefore by means of ukaz he restored the proper censing and ringing of bells. Called to apostolic service in this frontier region, Sainted Sophronii realised, that in addition to the enlightening of believing christians, it availed him to bring to the faith idol-worshippers, who were very numerous in Siberia. To bring pagans to the Church of Christ was difficult, especially since from time to time there was no one to serve in churches, and to borrow for missionary activity made matters all the worse. Knowing how that the hierarchical Divine-services would have a salutary effect on non-Russians, the saint not only himself served with reverence, but also required it of all his clergy. Sainted Sophronii concerned himself over the manner of life of the lesser nations and he contributed to the developement of a stable culture among the local people. He offered them monastic lands for settlements and in every way he endeavoured to isolate them from the influence of paganism. A throng of visitors constantly arrived and came from faraway places for a blessing. But amidst his many cares, he did not forget about his inner spiritual life and eternity – he also led an ascetic life. There is preserved an account about this from the cell-attendant of Sainted Sophronii, which relates, that the saint "used food simple and in small quantity, he served quite often, spent the greater part of the night at prayer, slept on the floor under a sheepskin or if fur – a deerskin or bear hide, and a small simple pillow – this was all his bedding for a sleep of short duration". The spirit of his ascetic life fit in with the general uplift of the Christian spirit in Russia following the glorification of Sainted Dimitrii of Rostov (Comm. 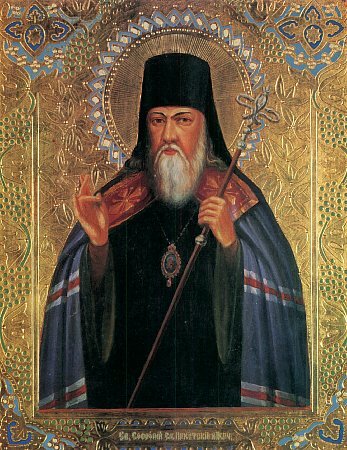 21 September), Theodosii of Chernigov (Comm. 9 September), and in particular the uncovering of the undecayed relics of his predecessor – Sainted Innokentii of Irkutsk (Comm. 9 February). This event inspired Sainted Sophronii with greater strength and encouraged his hope for the help of Sainted Innokentii in his task of building up the diocese. Until the end of his days Sainted Sophronii kept his love for the Krasnogorsk Zolotonoshsk monastery, which had nurtured him in the days of his youth. He constantly contributed support for its upkeep, sending off the necessary means for this. Having sensed a deterioration in his health, Sainted Sophronii made a petition to the Synod to discharge him for rest. But they tarried with an answer from Peterburg, since it was difficult to immediately choose a worthy successor. The final days in the life of Sainted Sophronii were spent in prayerful asceticism. The light, which shone on the good deeds of Sainted Sophronii, continues to the present to testify to the glory of the Heavenly Father, "mercifully having strengthened His saints". And now not only in Siberia at the place of his final deeds, but also at the place of his first deeds, there is reverently preserved the holy memory of Sainted Sophronii. A second commemoration of Sainted Sophronii is made on 30 June (glorification, 1918).